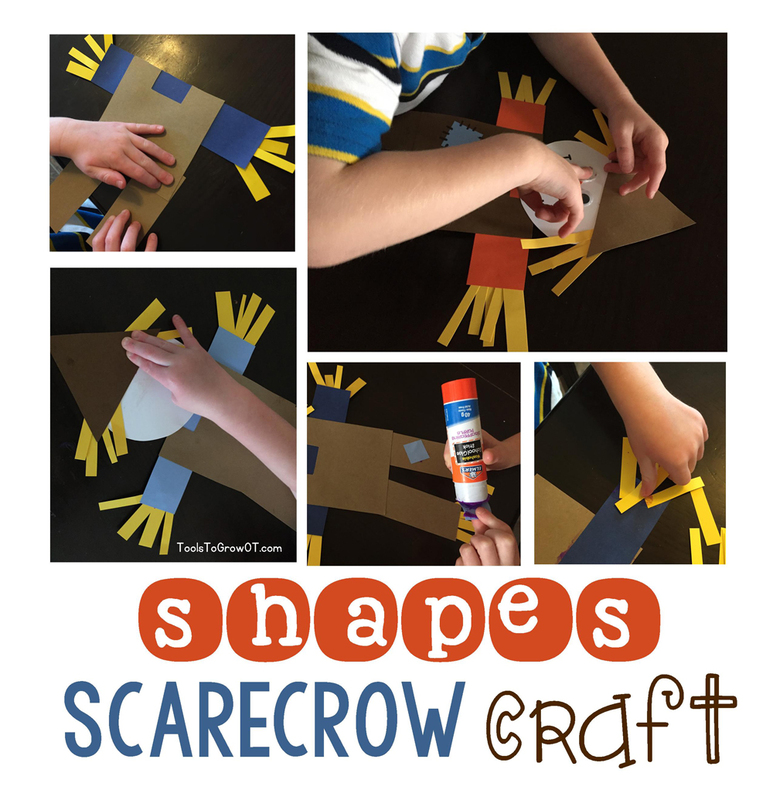 Shapes Scarecrow Craft | Blog | Tools To Grow, Inc. Autumn has arrived and we have a fun fall themed scarecrow craft that kids will love to make that addresses a variety of fine motor, bilateral integration, visual motor coordination, and praxis skills. 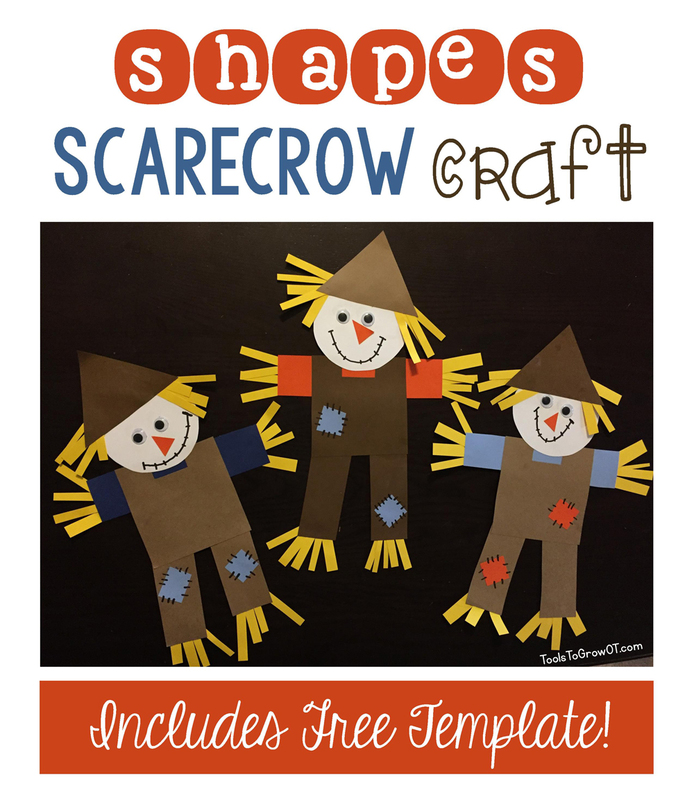 We have included a FREE Printable template/pattern for this scarecrow craft. This trace, cut, and paste craft is a great way to help younger children learn shapes while practicing tracing and scissor use skills. Older children can be expected to plan, sequence, and execute the steps needed to complete this adorable scarecrow. 1. Print out FREE Scarecrow Pattern/Template on cardstock or heavy paper. Find it Here! 1. The child uses the stencils (pattern) to trace each part of the Scarecrow as indicated on colored construction paper. * For example, the child would trace the leg/bottom of overall pattern two times on colored construction paper. * Note: When cutting out the straw for the hair, legs, and arms - cut out larger shape and then snip paper into smaller rectangle shapes/strips. * Note: Cut out a smaller square on the top middle of the overalls (where dotted lines show). 3. Discuss and take this opportunity with the child to identify all the shapes that make up the scarecrow. 4. Glue top portion of overalls (square shape) to arms (rectangle shape). 5. Glue legs/bottom portion of overalls (rectangle shapes) to top portion. 6. Glue smaller snipped rectangles (straw) coming out of the arms and legs. 7. Glue head (circle) on top of overalls. 9. Glue the hat (triangle) on top of the head. 11. Cut out a small triangle for nose, or draw a nose with marker. 12. Draw a mouth with marker. 13. Optional: Add small squares for patches on the overalls. Find all our fall/autumn themed resources here. Find all our Fall/Autumn themed blog posts here! Looking for Halloween activities and ideas? We have lots! Read all our Halloween Blogs here! Find Halloween themed resources here!